If you search the term “guided fishing” you will find over three million results! How are you supposed to choose from such a large number? This is where Outdoor Solutions comes in, we love to fish and have traveled all over North, Central and South America doing so! In fact, my love for fishing is what got me started in the industry 16 years ago. I grew up on a 2000 acres cattle ranch in Oklahoma with 19 ponds on it, some of them large enough to put a small bass boat on. I could walk in any direction and be in some of the best Bass, Bluegill or catfish fishing in the states! Once I discovered other types of fishing in other regions, it was all over, I couldn’t get enough. Now the Outdoor Solutions team shares our favorite fishing spots from all over the globe with you. One of the things we love so much about fishing is the diversity of locations, species and techniques. As many places as we have been to, we always seem to learn something new on each trip. Even on return trips to the same destination with a different guide we learn new methods of fishing. We can’t think of a better social outdoor activity than fishing. Sharing a boat or shoreline space with a family member or a best friend is one of the best ways to create memories that will last a life time. One of our most recent fishing excursions took us to Central Manitoba to celebrate our son’s graduation. The trip included 3 generations of men in our family and my Father in Law. Even the travel there was part of the adventure. 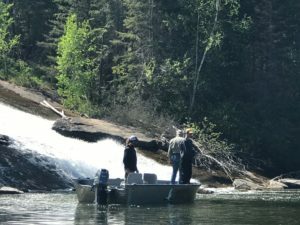 Once the commercial travel was over, we found ourselves standing on the pontoon of our float plane, ready to take us to the lodge and the river system where the fish were waiting. The photo worthy moments started immediately when the pilot asked our 18 year old son if he would like to sit in the co-pilots seat and it just got better from there. The memories of boating close to 200 fish per day (not a typo) between the four of us, watching family catch several first during the trip are things that will not soon be forgotten, but I think we all agreed that the shore lunches of fresh Walleye that we had just caught that morning being cooked in a cast iron skillet over a camp fire is what will bring us back! Another favorite Northern fishing destinations is Alaska. You may initially go for the fishing but you will come back for the scenery or possibly because your freezer is running low on fresh caught Salmon and Halibut. 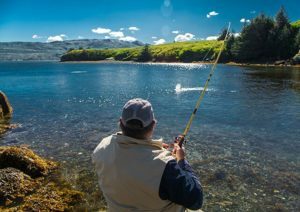 Alaska has plenty of options when it comes to fishing, fresh water with the many lakes, rivers and streams for trout and salmon during the salmon run or hit the open sea for saltwater salmon and our favorite, halibut! In the way of lodging, our Alaskan fishing outfitters offer everything from camps as remote as you would want to be, to some of the most pristine shoreline lodges you are going to find. No matter your preference the Outdoor Solutions team will have the perfect choice just for you. How about somewhere with a little warmer climate? Some of our favorite couples fishing destinations include, Belize, Costa Rica and Hawaii. We have found that Costa Rica is a tough one to beat, especially since you can fish both the Pacific coast and the Caribbean Sea. Both offer two completely different experiences on the same trip. Twice now, we have started on the East coast of Costa Rica and found ourselves staying in the middle of the jungle right on the Rio Colorado River. One look at the lodge compound and you will understand that an enormous amount of work went into building this little Oasis. The East Coast of Costa Rica is known for giant tarpon and this particular trip did not disappoint! As I had mentioned, we stay right on the Rio Colorado where tarpon will venture up into the fresh water but the majority of the fishing for these Silver Kings is done beyond the breakers that separates the river and the Caribbean Sea! If you have never caught a tarpon, you are missing out on one of the hardest pulling, aerobatic sport fish you will ever encounter, not to mention one of the hardest to land. Because of their hard, sandstone type mouth, they are hard to hook and easily throw your hook during one of their many tail walking jumps. The averages for landing a Tarpon are only 1 in 5! In fact one of the techniques for preventing the Silver King from throwing your hook is called, “bowing to the King”, this is where you lower your rod tip and push it toward the fish, allowing some slack in the line. Typically after spending three days in the jungle, we pack up and head to the Pacific Coast for a completely different type of experience. One of our favorite places is the very Southern portion of Costa Rica, just above Panama, called Golfito Bay. Here you will find a lavish resort, chef prepared meals, in a setting worthy of a post card. The fishing offered here is probably the most diverse for one single area that you are going to find. You can spend your time, inshore for the very unique and highly sought after Rooster fish, or hit the bottom structure for grouper, snapper and barracuda. Once you’re ready for a change of pace, Marlin, some of the biggest Sailfish you will ever find, Dorado and Tuna are not far away and with the outfitters 32 foot Contenders, powered by twin 300 HP motors, it won’t take you long to get there. 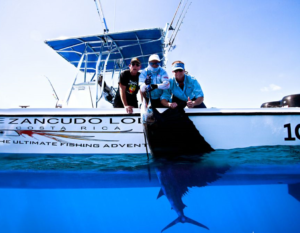 Our final fishing destination that we will share with you is an all-time favorite, Belize! Logistically very easy to get to, a quick connection through Dallas or Miami and you will be on the water the same day you leave home! Our outfitter is on Ambergris Caye. The main lodge as well as the four separate villas are right on the water with nothing but white powder sand and palm trees between you and the water. If you are one who loves the water but worries about motion sickness then our location in Belize is for you. With an average water depth of only 8’ you do not have to worry about large swells, in fact the majority of the time, the waters are very calm and flat. The majority of the anglers that come here are avid fly fishermen that are targeting Bonefish, Permit and Tarpon. I know I am going to make the true fly fishermen cringe here but the majority of our time spent in Belize, we are using spinning gear and have a blast with our numerous Bonefish hook ups and the occasional Permit and Tarpon but our favorite part is the Caribbean style shore lunch! After a morning on the reef catching snapper and grouper our guide takes the morning catch along with fixings prepared by the lodge chef, we enjoy one of the best dining experiences imaginable. All of our fishing destinations can be viewed in the drop down menu above. Be sure to contact Outdoor Solutions for questions on any of our fishing destinations.